Weather cloaks our landscapes in an infinite variety of moods. I’ve always thought this blog should showcase their beauty. For a year or two, the blog’s banner has been taken from a photo I snapped in May 2012 of the Murrays Bay wharf as sunlight poured from behind autumn rain that had just drenched the beach. In real life, the scene was breathtaking. This is how my clever wee Olympus SP-600UZ saw it. 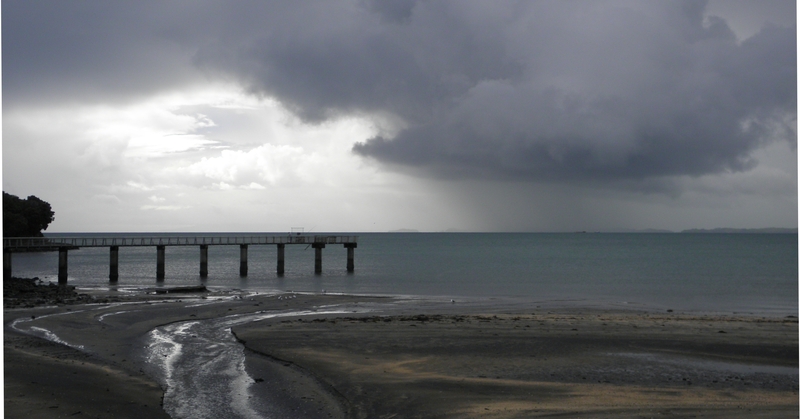 Murrays Bay wharf; sunlight and cloudburst over Hauraki Gulf, May 2012. Weeks ago Bob suggested the blog needed a ‘more colourful’ banner. Last night I got around to finishing it after the Black Caps had dismantled the West Indies cricket team during an exhibition of batting splendour from both sides. NZ made an astonishing 393 which the West Indies had no hope of reaching; we bowled them out for 250. Guptill’s toil began with the first ball of our innings, finally ending when he left the field at 235 not out—a genuine hero. 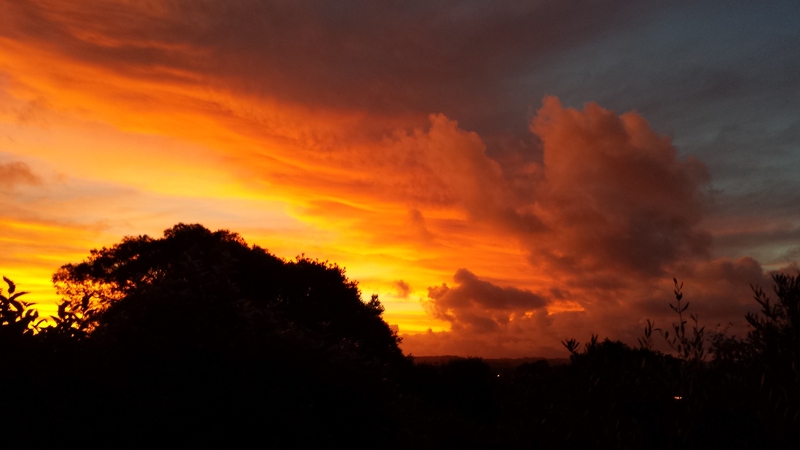 Glorious Waiuku sunset. Click to enlarge. Some readers might remember the earlier banner. It used a 2006 photo I took from our back verandah. I liked the delicate tracery of the bare branches of the oak tree next door and the cold look of the sun. 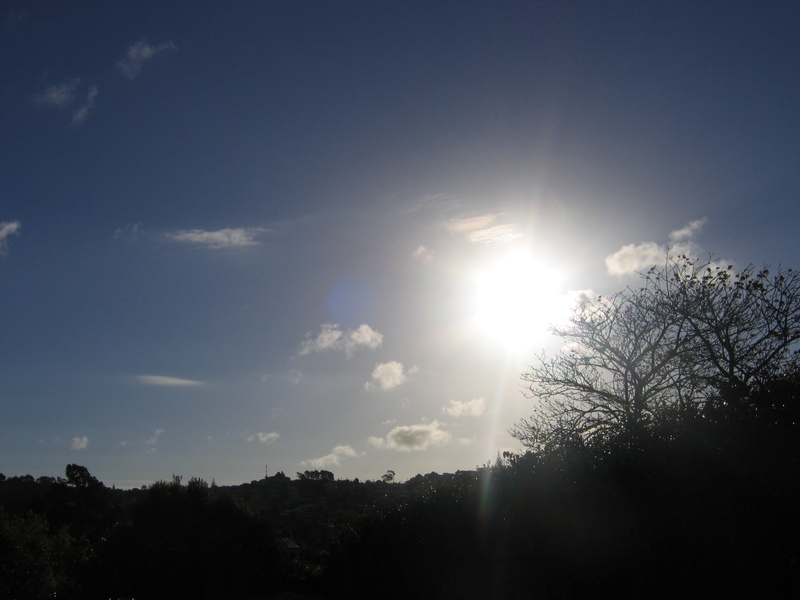 Western winter sun from our back verandah. Click for original photo. RT, have you captured any late afternoon light on say a park scape after rain when the air is crystal clear? Apparently it’s the late afternoon “blue” light that keeps you awake later if you stay out in it in the evening. I love that light after rain, it brings a completely different picture to vision. Especially the clarity of grass and trees or the effervescent foam of small breaking waves on the seashore. Very difficult to capture by camera unless you’re an expert with filters, no example that comes to mind unfortunately. Can’t remember trying myself. I only ever used a “skylight” filter when indulging in photography some years ago but motor racing mostly, not so much nature. Thinking about it now, a skylight filter would probably filter out the effect above. I worked with a women once who had a passion for photography. She spent a lot of time out at night (2am quite normal) capturing city scapes by time lapse. As Spike Milligan (in Goons) put it “Everybody’s got to be somewhere”. Oh yeah, nice new banner. ‘Blue’ light, eh? Interesting. I had not heard that nor have I captured any. I’m no expert and have no filters. My elder son is a good keen photographer; I’ll forward your remarks to him and ask him to comment. UV-specific filters redundant now on some lenses and skylight filters out UV anyway. See comments re colour balance of subjects bathed in light from green foliage under a clear blue sky. And snow and beach scenes. I had skylight filters on every lens in my bag, a must for outdoors IMO not just for lens protection. But for extra clarity the less glass the better (maybe). Capturing the late afternoon effect upthread would be a different approach than say mid morning to mid afternoon photos. I’m not sure the “blue” is in or out for late (leave or remove a skylight filter?). Intuitively to me, there’s not a bright blue sky in the late afternoon so blue is in (no skylight filter – could be wrong). Maybe a different filter even and see the comment re blue in shadows. It’s really the clear air after rain that makes the clarity difference in the late afternoon anyway whether green foliage, grass, beach, whatever so filters may not be a big consideration. It’s eliminating the sun as much as possible I think which means timing it right. Most incongruous motor racing photos I’ve taken were of bikes at Hamilton Lake street racing. The course emerged from the lake gates which was a rock arch flanked by very colourful flower plots. A riot of colour when combined with bike getups and rider leathers (post black). A bit like gardening circle meets designer graphics. Which means eliminating shadows (contributes hugely to the effect – actually quite weird). Blue is in shadows so maybe should be filtered out by skylight filter. The type of clouds present after rain make all the difference too. The effect occurs when diffuse and reflected light is coming in from every direction – not direct from the sun.